Ever glamorous and luxurious, the Day-Date model delights with its myriad of dial, bracelet, bezel and gold-finished designs. The firm has elevated its Day-Date models with materials such as rubellite, blood stone, coral, and even fossil, providing an unusual design twist to the iconic model. This rare variant of reference 18038 is fitted with a dial displaying beautiful sapphire baguette-set numerals and champagne tone. It is furthermore preserved in excellent and impressive condition. 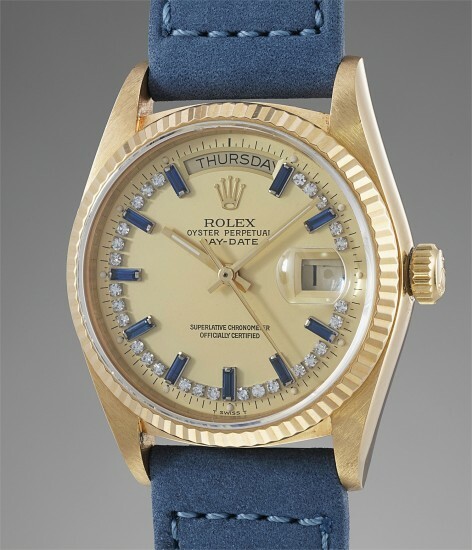 The case has probably never seen polishing throughout its lifetime, and the dial displays luminous dots that are round and intact, having aged with warm patina.